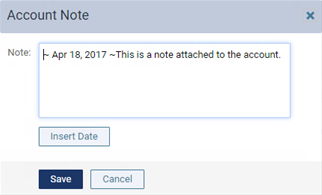 You can quickly view an account note attached to a patient's record and edit that note as needed. On a patient's Overview page, the Ledger box displays the patient's balance, the name of his or her primary guarantor, and an account note icon. If the icon is blue , there is a note for the account (a gray icon indicates that there is not a note). Click (or tap) the icon to view or edit the note. On a patient's Ledger page, the name of the patient's primary guarantor and an account note icon appear. If the icon is blue , there is a note for the account (a gray icon indicates that there is not a note). Click (or tap) the icon to view or edit the note. The Account Note dialog box appears. Change the text of the note as needed. Note: You can also access and change the note as needed from this patient's record, the patient record of this patient's primary guarantor, or the patient record of any patient who has the same primary guarantor as this patient.